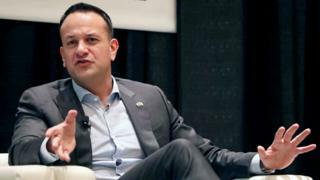 Irish Prime Minister Leo Vardakar has ruled out suggestions that those crossing the Irish border after Brexit might need to pre-register. The taoiseach was reacting to reports that this was one idea being considered by the UK government. "It is not a solution that we envisage," he told an audience in Austin, Texas. The future operation of the Irish border has been a sticking point in the negotiations between the UK and the EU. Could US-Canada border end Irish dilemma? Both sides have said they want to avoid a so-called hard border - the installation of physical barriers and customs checkpoints - between Northern Ireland and the Republic of Ireland. The idea of pre-registration has come from a report by a customs expert which was prepared for the European Parliament. One potential solution put forward in the Smart Border 2.0 report is that people crossing the border after Brexit would have to register in advance to avoid checks and delays. However Mr Varadkar dismissed it, adding that it might be helpful if British senior cabinet officials such as Boris Johnson and David Davis visited the border to see first hand that it was "invisible". "They would certainly be very welcome to visit the border," he said. "Secretary of State Karen Bradley has already done that and a delegation of British politicians from the House of Lords and House of Commons have done that too. "I can't see anything negative in a British cabinet minister viewing the border, seeing what it looks like. "You can read as many briefing documents as you like, sometimes you need to see things with your own eyes." The UK government has said the country will leave the customs union and single market. That will necessitate some form of new customs controls between the UK and the EU. Mr Varadkar is currently in the US for St Patrick's Day engagements. MEPs from across Europe are visiting Northern Ireland and the Republic of Ireland to discuss the impact of Brexit. They are scheduled to meet Sinn Féin MEPs Martina Anderson and Matt Carthy on Monday. Q&A: Could US-Canada border solve Irish dilemma?